Faith at War, by Yaroslav Trofimov. 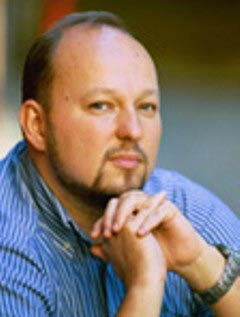 Yaroslav Trofimov in 2001 became the Wall Street Journal's roving correspondent for the Middle East, Africa, Central Asia and the Balkans. He speaks Arabic. The following focuses on Trofimov's experiences in Iraq, which he covers in four of his fourteen chapters – chapters six through nine. Iraq had just started lobbing missiles into Kuwait, thankfully of the less-than-accurate kind. An American convoy passed us on the road, and I realized with a chill that all these soldiers were now wearing chemical suits and gas masks, looking like aliens fresh off a spacecraft. I sniffed the air, remembering from my British class that lethal gases smell like rotten eggs or freshly cut grass, and looked out the window to see if birds were falling from the sky. We leapt out of the car to don our gas masks and to shroud ourselves in chemical suits, gracelessly squeezing into heavy rubber boots and gloves. If there had been a real gas attack, of course, we'd have been long dead by the time we were done zipping up. In the desert, once we reached the four-lane highway toward Iraq, a tableau of American military might unfolded before our eyes. Thousands of tanks, Bradley fighting vehicles, Humvees, and transport trucks emerged from desert tracks on both sides of the highway, joining it as smaller blood vessels converging into a throbbing vein. Whipping up clouds of sand, this armada slowly inched toward Iraq, halted only by the occasional traffic accident or an engine breakdown. On all four lanes, the traffic was northbound only. With other journalists not embedded with the U.S. forces, Trofimov was blocked at the main crossing point into Iraq by U.S. Marines. Instead the journalists moved along the border and followed British armor personnel carriers, the journalists in vehicles labeled with large letters, TV, made of duct tape. There was fierce fighting ahead, and a British captain disliked the journalists' presence, saying: "It's dangerous here, and I strongly urge you to go back, but I can't make you do it." On the road north to Basra, in the Shiite town of Safwan, Trofimov came in contact with civilians and began asking whether what they were experiencing was for them liberation or occupation – mindful that some would answer with what they thought he would want to hear. How can we be happy? They are killing our people here. We want our country to be independent again, and the Americans to leave under a United Nations guarantee. And Trofimov found reactions mixed. Days later, in the larger city of Umm Qasar a young lawyer in a Bedouin robe, Ali Yasser, asked Trofimov, "Why, do we have all this occupation and all this destruction?" Yasser exposed a t-shirt with a picture of a smiling Saddam Hussein. "People love him, " said Yasser, "because he's a strong man and we will never have someone as strong again." Another Iraqi approached and said, "Saddam is a criminal and a crook." On his journey following the military to Baghdad, Trofimov listened to an Iraqi complain that the United Nations had done nothing to prevent the invasion. His wife was impatient. She asked, "Where is freedom? We have no power, no water, no gas. Tell Mr. Bush that I have dirty clothes." A tomato farmer, Jaffar Shaddad, referred to Saddam's attack on the Shiites in 1991 and told Trofimov, "Now is not 1991. Now Shiites hate America." Another tomato farmer, irritated by the British military's thorough searches, asked, "How would the English like it if the Iraqis tried to stop them on the way from one English city to another? This is Occupation. Nothing else." A local food depot manager, Mohsen Galban, with anguish on his face, complained to Trofimov: "We ask the Army for help, but nobody helps us. American soldiers are simply encouraging the thieves." Another commented, "We want an independent and free country that won't have any foreign soldiers on its soil and that will govern itself as soon as possible." One asked the general to explain the anger against the Americans that was being voiced so often on the streets of Baghdad. He attributed the feelings to a misunderstanding. "Iraq has been in a dark room with no light for thirty-five years and, two weeks ago, we opened the door and pushed them out in the sunlight and they cannot see yet. It was disheartening to see how America was reduced, in the minds of these clerics, and the mobs who hang on their every word at packed sermons, to a confused caricature of a soul-less vampire state. But I could see why such paranoia was flourishing. The only Americans most Iraqis have met were young, nervous soldiers in full battle rattle who usually expressed themselves with gestures and expletives and, above all, shot without paperwork. It would become even harder to argue about Western values of freedom once the iconic photos of naked Iraqis tortured by American soldiers at Abu Graib prison became, for many, the most memorable symbol of America's effort to spread democracy in the lands of Islam. He asked a merchant if he was afraid of the Americans. The merchant said that an American patrol rumbles by about three times a day. "But when they come, everyone hides the weapons behind their backs and looks at the Americans with a wave and a smile. They never stop and never seize anything." Even if you turn this country into heaven, we don't want it from you. Just go away from Iraq and leave us alone. We've had enough of you and can't stand it no more. Suddenly, writes, Trofimov, "the hall erupted in thunderous applause that lasted for minutes. Silverman's face was locked in an uncomfortable smile. With things getting out of hand, we had to beat a retreat." After Silverman and Trofimov reached relative safety an Iraqi with them tried to explain what had just happened. "Our people," he said, "have seen Americans in Hollywood movies and were impressed by how educated and polite the Americans are on-screen. But now these people have seen your soldiers in real life." Trofimov covers much more about the Americans in Iraq, including Fallujah. What I've written here doesn't do Trofimov's book justice. Publisher's Weekly writes that "Trofimov puts just the right blend of cultural perspective and personal experience into his tour." And the Washington Post's Book World writes that "At his best, Trofimov is a master of microcosm." Trofimov's first two chapters are about his journey to Saudi Arabia soon after the September 11 attacks on the World Trade Center. He found official denial of anti-Americanism, but a plentitude of it among others. Saudi's were being told in newspapers and mosques about a "an American conspiracy to control the Middle East and keep oil prices low." There were clerics who were dividing the universe into true believers and infidels, clerics believing that the infidels were a source of corruption who should be shunned and eventually converted or destroyed. Trofimov's other chapters are: (3) "Tunisia: Teaching Freud to the Mullahs;" (4) "Yemen: You're here to Pinpoint Air Strikes against Our Mosque;" (5) "Kuwait: to Bora Bora and Back;" (10) "Afghanistan: the Brandy of Kabul;" (11) "Afghanistan: Why are you afraid of the Soldiers?" (12) "Lebanon: Even the Goats come from Hezbollah;" (13) "Mali: A Ballot Box in Timbuktu;" (14) "Bosnia: All These Books I got them from the Arabs." Copyright © 2007-2014 by Frank E. Smitha. All rights reserved.